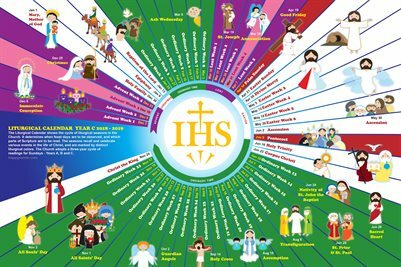 12" x 18" 2019 Liturgical Calendar Year C Poster, illustrated with Happy Saints cartoon artworks featuring major feast days in the Christian and Catholic tradition. Ideal for children and the whole family! Great for homes, catechism classes and Sunday schools, religious education, churches and parishes the whole year round!